﻿The adventures of Beethoven Bear and Mozart Mouse continue in this series of supplementary solo and activity books which specifically correlate with the Little Mozart Lesson Books. Your child will enjoy practicing these charming and familiar pieces during the Christmas season. 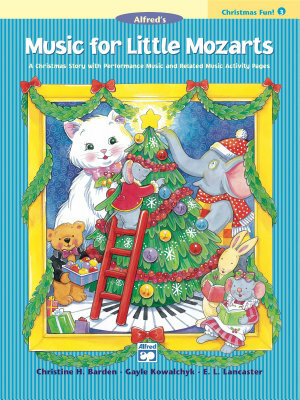 All books allow for Carolyne to play duet with your child as they are learning. When titles are repeated, the content is more complex than the earlier version. Your child will enjoy the Christmas story, with its related songs and illustrations, of Beethoven Bear and Mozart Mouse waiting for Santa.